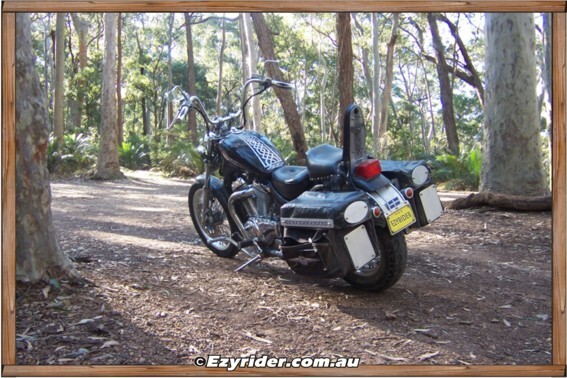 ﻿ Motorcycle & Motorbike Camping - Pictures & Information. "We Engage in Ventures in Life that Lead Ourselves to a Realm of Self within another Dimension"
It has been some time since I've been camping on the bike. The last few years has seen my progression into another depth of life and the meaning of same. I write, speak, listen, observe and gain an appreciation of life through the awareness of knowing. I believe we all progress for a reason and my reason at the time of motorcycling and camping was not this whole reason. It was a lead up to understanding the freedom it gives with oneself which in turn I can now relate to that important feeling with how I live now. If I hadn't done it I would not have progressed with all the knowledge I experienced. I call this empirical knowledge. I still ride and always will as long as I am able. It is an amazing feeling of freedom. I will now attempt to explain: "Why motorcycle and why motorcycle camping?" There is nothing that compares to riding a motorcycle (the freedom) on the open road and setting up camp somewhere along the way. The analogy could be compared to the 'old wild west' horse riding in the country, riding from town to town, and setting up camp (with an open fire) in the outdoors. It is a life of freedom with your thoughts, or no thoughts, just freedom, where one is in touch with our intrinsic natural feelings, away from the materialism of our society. If you don't ride, watch a western movie, and compare this analogy with a motorbike - a horse with a motor. Motorcycle riding is in some ways a metaphor of the 'old wild west' horse riding. My motorbike was born in 1985 and modified to suit my feeling of what a ride should be. A bit like choosing a horse for a purpose. Nearly 20 years ago, the bike was sitting in a garage, collecting dust. Couldn't start it, yet still bought it, took the chance, and loaded it up in the back of the hi-ace and drove home - where the development commenced. The following connections show a variety of modifications to suit the bike (horse) I wanted to ride. It shows we don't have to buy an expensive bike to enjoy riding. One just needs an imagination and a feel for feel. It's not about 'name bikes.' It's about akin with oneself and the ride with a friend (the bike) that was created for you. This is your life and the bike is not a bike. Rather an extension of yourself. An extension of a feeling. As I like to carry a range of camping equipment there was a necessity to create and build a suitable rack, attach it to the bike, and strap everything on. It also had to be easily dismantled from the bike. This page is a comprehensive guide, with pictures, on how to build one yourself. I wanted a bike that didn't cost much, with simple straight styling, so I could modify it to suit what I wanted in a bike. Another important aspect was: Low seating, to be able to sit flat footed when stationery. It is now 30 years old. This page shows what I did, from building saddle bag racks, economical saddle bag improvisation, wrap around rear guard, through to highway pegs, lights, handle bars, sissy bar etc. Once the cruiser rack is in place it is a simple procedure to load and tie down the gear. This page shows, with pictures, how all equipment is tied to the cruiser rack. I have had 2 or 3 small tents in the past and over time found them cramped. To fit everything in the tent a larger one was necessary. I chose the OzTrail Breezeway (family version) for a number of reasons, and not limited to: quality, standing height and weight. This weighs 13-15 kilos. This page gives a step by step, with pictures, on how to erect the tent. Plus pictures of the interior.